In his research note Monday April 1, 2013 — Oppenheimer Asset Management’s chief market technician Carter Worth argues that the market is ahead of itself and that investors are right to anticipate and position for a normal, 9 percent Stock Market Correction. Worth notes that the move off the November 16, 2012 low of 1,343.05 to the high a week ago of 1,563.32 is a mature intermediate advance. He said it is mature in terms of magnitude (up 16.4 percent) and duration (18 weeks in the making), which leaves the S&P 500 in a steep uncorrected position. The technician tells his clients that a Stock Market Pullback is in the cards, just like the last two times the market advanced four to five months without pause. “Further, we believe those who continue to blindly/stubbornly stay long without trimming in any way, are embracing asymmetrical risk/reward, chasing limited upside while risking disproportionate downside,” Worth said. While the charts might point to a correction ahead, James Stack of InvesTech Research said historical evidence points toward further gains. The S&P 500 has now moved upward in 10 of the past 11 weeks. Over the past 85 years, there have been 23 instances when the S&P 500 has had a similar winning streak. While it is unusual for the market to be up in 10 of 11 weeks, Stack said, it is not necessarily a sign of imminent trouble and a pending market correction. 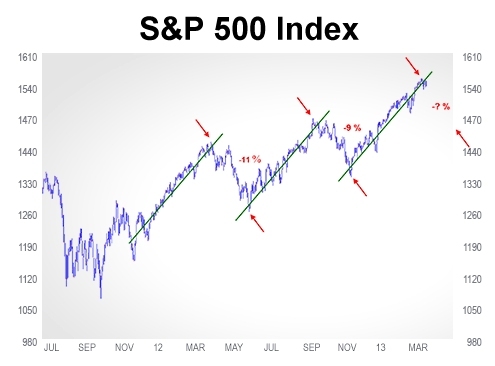 When that has happened, the S&P 500 moved sideways roughly half the time in the following month. But by the end of three months, there was a median gain of 4.9 percent. Gains really picked up six months and even a year later, when the index rose on average 7 percent and 12.6 percent, respectively. There were only two instances when the market was down more than 5 percent (1957 and 1989), but both occurred when there was significant tightening of Federal Reserve policy during the preceding 18 to 24 months, Stack said.